My little boy had been complaining a month back that he cannot breath very well at night. At first, I attributed it to the stuffy nose he had. To help him breath better, I used some nasal stripes on him and it seemed to work. Then the husband started commenting that the boy would take deep and long breath during bedtime reading. Finally, after procrastinating for many weeks, I got my act together and tried to book the little one an appointment with a respiratory specialist. It was not straight forward getting an appointment. I called KK Women's and Children's Hospital initially and was told that the earliest appoint they had was almost two months away in late November! Yes, they are the best paediatric hospital in Singapore but errr, no thanks. I spent a couple of moments googling and found Dr. Jenny Tang of SBCC. She seemed to be highly recognised in the field of paediatric respiratory health having held the position of Head and Senior Consultant of Respiratory Medicine Service in KK previously. Being in private practice meant that the wait could be shorter and since I had delayed for about a month and the little boy did not seem to get better, I thought I had better get him checked out sooner rather than later. I was fortunate that the next available appointment was only 3 business days later, in less than a week. The only thing was that I had to take the boy out of school. Oh well, health is definitely more important. And I am glad I made that choice. We waited for some time before managing to see Dr. Jenny on the appointment day as the clinic was busy. However, she was very patient and efficient in taking in the details and asking the important questions. After verifying our family medical history, she decided to send the boy for some test. 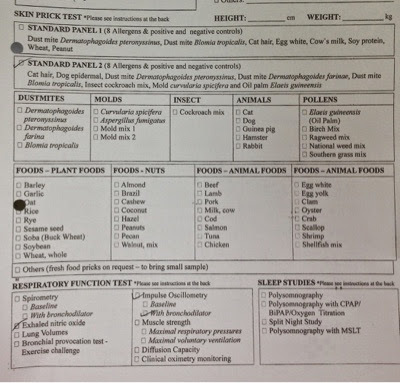 He was required to take a Standard Panel Allergy Test and two Respiratory Function Test. The lab to do the test is within the clinic itself. 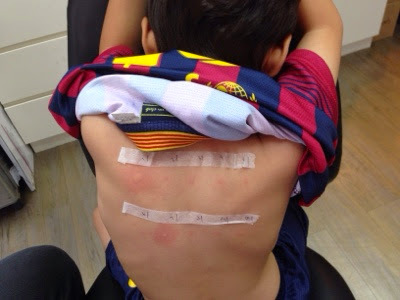 For the Standard Allergy Test, instead of the arm which is the commonly pricked location (which Laetitia had once in Paris and once in Singapore), they do it on the back. They explained that the back is actually more accurate. Here's the boy right after the 10 different pricks, before the reaction started. The boy was very brave and calm, he did not even flinch once when he was pricked 10 times. After that, we had to wait about 15 mins for the reaction to show up. 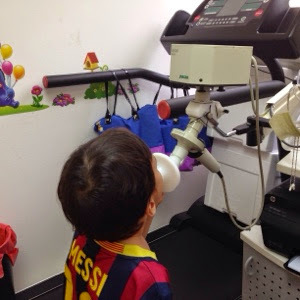 The boy also went through two different lung function tests, namely a Exhaled Nitric Oxide Test to see if the airway is inflammed and a Impulse Oscillometry test. Unfortunately, the test did not come back very well. Although there was no inflammation in his airways, his breathing capacity with and without medication was indicative of asthma. The difference was significant enough to indicated that his airway is not fully opened up. And so, he was prescribed with various medication including Ventolin. Thankfully, the Ventolin does not need to be used unless he was a wheezing spell. It was more a medication for emergency. 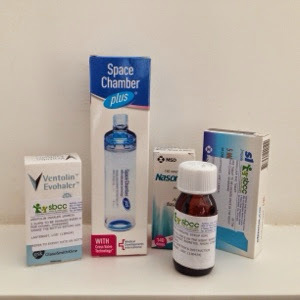 However, he would need Singular that is supposed to help open up the airways and was given some medication for his allergy rhinitis as well. Moving forward, I am working on reducing the dustmites in our house, especially in his bedroom and also increasing the use of Essential oil and TCM to help build up his respiratory health. I would like to decrease the use of pharmaceutical drugs and go more natural for his body but I also want to make sure I do it without risking his health. I will share more on our journey to deal with this diagnosis naturally.